Hermit crabs are definitely not insects, but they are a very nice pet for the invertebrate enthusiast! I keep five of them and they are a lot of fun to watch. 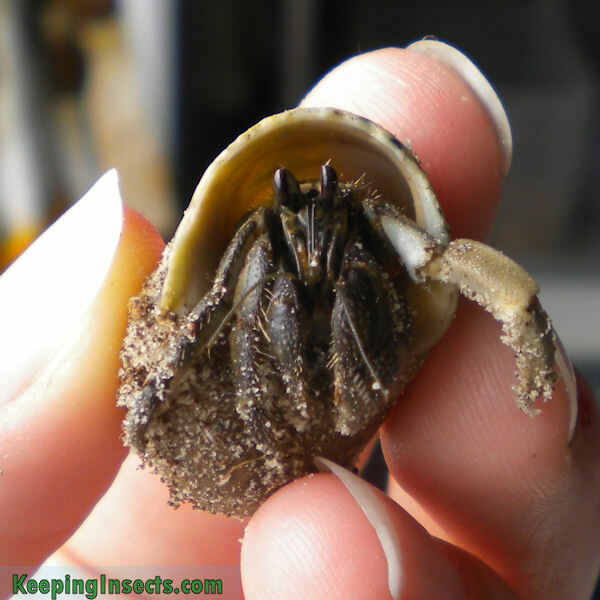 This page will tell you a bit more about hermit crabs in general and how to keep them. Hermit crabs are similar to lobsters and live inside shells of other animals, mostly shells of sea snails. The back end of their body is soft and fragile, this part is protected by hiding inside a shell. There are around 500 species of hermit crabs described. Hermit crabs are born in the ocean where they live as swimming larvae. Most species develop into true hermit crabs in the sea and will remain there. Other species will continue the rest of their life on land. These are the land hermit crabs and they are the most common hermit crab to keep as a pet. Land hermit crabs still need the sea to obtain salt water and to reproduce. 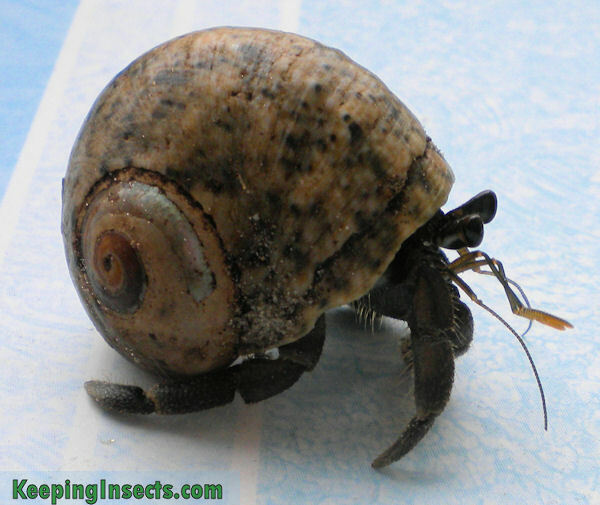 This page only deals with land hermit crabs and not those that live permanently in the sea. Hermit crabs have 10 legs, of which the first pair are claws. The next two pairs are made for walking and the rest of the legs are used to stay inside the shell. Hermit crabs have two eyes on small stalks and have two antenna-like structures (called antennular flagellum) to feel the surroundings around them. Land hermit crabs come in many colors, depending on their species, age and environment. Most species are brown-gray in color but there are also bright red / orange species. A brown hermit crab, probably Coenobita clypeatus from the Caribbean. Land hermit crabs can be seen walking around in their enclosure day and night. They are quickly startled by movement or vibrations, causing them to retract themselves completely into their shells. But after a short while they show up again to continue what they were doing. When you pick a hermit crab up and softly blow air into its shell from a distance they will show themselves again. Hermit crabs shed their skin by molting. They do this in a moist environment, generally by digging themselves in sand or soil. So when your hermit crab digs itself in you should leave it alone to allow it to molt. An example of hermit crab housing for two small hermits. Land hermit crabs need an enclosure that is big enough to house all of them. 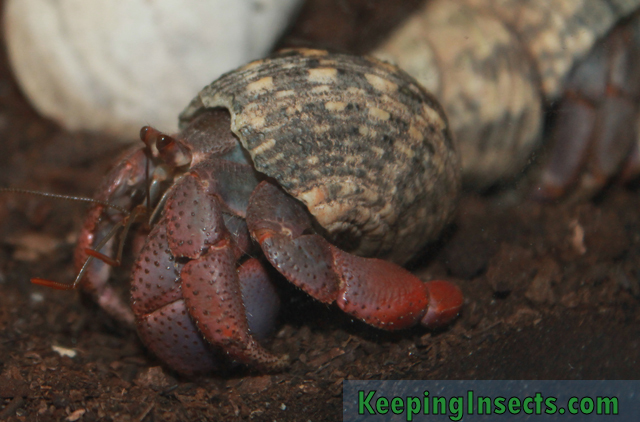 It is hard to say what a proper enclosure is, because hermit crabs differ in size a lot. Obviously, bigger hermit crabs need more space than small ones. There is no need for a lid on the enclosure as long as there is nothing to climb onto to get out of the tank. However, when you keep the enclosure in a very dry place a lid can help to maintain high humidity inside the enclosure. On the bottom of the enclosure you need to place a thick layer of sand or soil, around 8 cm thick. This soil is used by the hermit crab to dig itself into to molt. Do not use soil with added plant nutrients, pine tree needles or very acidic soil. Coco-peat, made of coconut fibers, is also very good to put in the tank as a substrate. Land hermit crabs like a place to hide under. You can give them some dry leaves, tree bark or some wood to hide under. Pieces of wood or stone are used to climb on. For decoration you can also place moss and real or fake plants in the enclosure. The real plants could be nibbled on a bit but generally they can survive pretty long in the enclosure. Water is very important for land hermit crabs. They need both fresh water and salty water to survive. The need fresh water every day but can do without salt water for about a week. Supply them with fresh and salt water in two separate cups or small trays. Make the salt water by mixing 1,5 teaspoon of salt on one cup of water (around 7 grams on 220 ml water). Do not use kitchen salt, but buy actual sea salt meant for sea aquaria. This has all minerals and metal ions in it that are also present in ocean water. Land hermit crabs are easy to feed as they will eat almost anything. You can feed them with raw fish, cooked chicken, cooked beans, cooked peas, cooked corn, nuts, fish food, apple, banana and other fruit. Do not feed them avocado, this is poisonous for them. A hermit crab walking around. Land hermit crabs need a humid environment. The soil on which they live should always be moist and you should spray with water every day. Hermit crabs like a tropical temperature, between 24 and 28 °C. In the night you can allow it to cool down to about 18 °C. 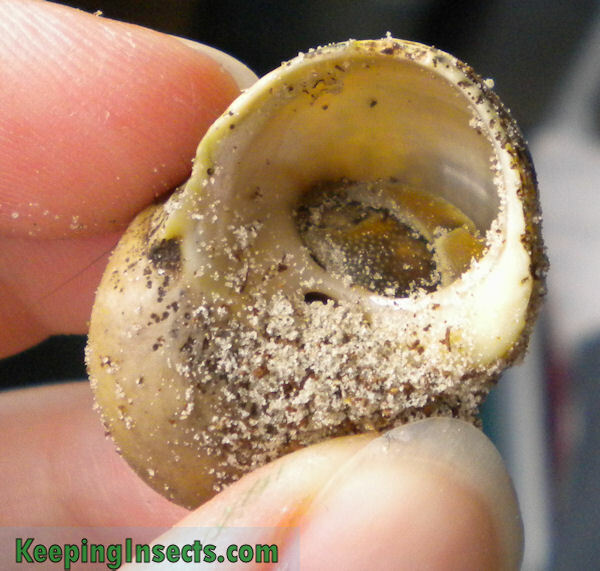 It is crucial that land hermit crabs can change their shell when their old one becomes too small for them. You need to place a few new shells in the enclosure so the hermit crabs can change whenever they want. When you do not supply enough shells the hermit crabs can fight over shells or even kill one of their kind to take over its shell. It is not possible to breed land hermit crabs as they need the ocean to do so. Consequently all hermit crabs you can buy are caught from the wild.